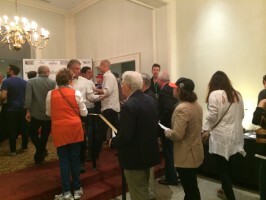 The midway point of the Charleston International Film Fest left no emotions behind at the Sottile Theatre doors. Four blocks promised surprises, enchantment, and at times, heartbreak. Documentaries were the first of the Friday screenings. Three very different films with contrasting subject matter prove that, no matter where you are in the world (Sweden (Bitter Sweet) , Somalia (Godka Cirka), the United Kingdom (The German Who Came to Town), people are constantly giving and receiving situations they may not anticipate. The second and fourth blocks, a reel of shorts challenged audience expectations from the get-go. Animation Hotline, a five-minute projection of anonymous voicemails sent to artist/director Dustin Grella covered both hilarity of the human experience as well as a confrontation with loneliness and desire. In The Graveyard Feeder, a short-comedy/horror, the main character deals with a very particular father-and-son scenario. My personal favorite, Door God, shows a haunting portrayal of a girl longing for a mother and the complications that arise between a broken family dealing with unreciprocated love. In twenty-three minutes, the interiors and exterior settings of a village in preparation for the Chinese New Year shows the beauty and sacrifice of every character in shot after shot of perfect mise-en-scene. I never wanted to leave that world (have you ever seen a woman baking date buns!?). Following the second block, three directors held a Q&A of their films. Ashley-Michel Hoban Jackie Doesn’t Wanna Get Married, Michael Lucas Intentions, and Dave Blamy Jars. The directors spoke of pre, on set, and post production challenges, the constraints of short films, and the inspirations that set the wheels turning. Hoban said it best when discussing the nature of shorts, “The film should be as long as it needs to be. Don’t let it linger.” Proving that all films, despite expectation or intention, are their own entities resistant to constraints. The theatre was packed before the third block, world premier of Sophie a short thriller, and feature-length drama The Sublime and Beautiful. Following a long day of screening (19 titles! ), the after party held at Mynt welcomed movie-goers and directors. 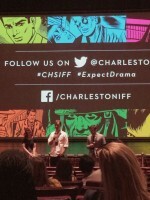 Thanks CIFF for another successful day and night! Posted on April 12, 2014 by admin.